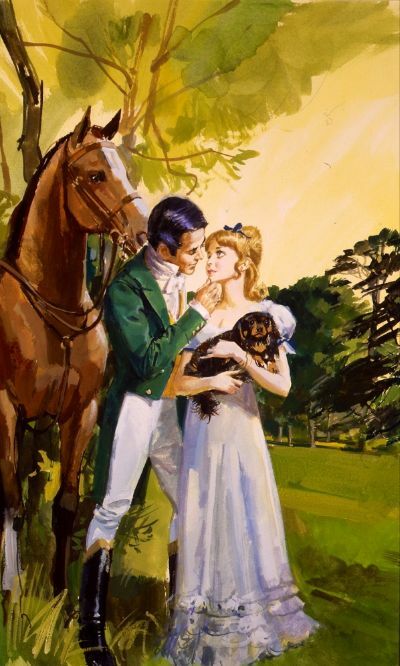 Horrified when her beloved dog, Rufus, is caught in a cruel snare while out walking in the estate of Arrow Castle, local Parson’s daughter Shenda is at first relieved when a handsome stranger comes to poor Rufus’s rescue and then at once she is abashed and confused when he claims a kiss Shenda’s very first as his reward. But then she is told that her father has been killed by a savage bull and that she must leave the family’s Vicarage forthwith. Penniless Shenda is obliged to take a job at Arrow Castle as a seamstress, where she stumbles across a letter from one of Napoleon Bonaparte’s spies to Society beauty Lucille Gratton, the most beautiful Lady in England’, who is staying at The Castle. Reporting the discovery to the Earl, she finds that he is no other than her gentleman stranger’ and just as she realises that she is falling in love with the heroic Earl of Arrow, she is embroiled in a counter-espionage plot that puts her young life and her love for the Earl in deadly peril.